We are conducting research on soil management in large-scale field farming in Hokkaido. In a large scale in recent years, in addition to further labor saving, it is desired to establish its system as a cultivation system with stable yields and quality.To achieve this goal, we need to develop soil management and diagnosis technology to support stable production. We are pursuing the development of new soil diagnostic technology that systematically presents such prescriptions. As soil management technology to maintain stable production of crops, we focus on utilization of symbiotic microorganisms living in the soil. We are also developing technologies to reduce the environmental impact of farmland. We conduct a survey on the difference in crop productivity of Hokkaido agricultural lands. Several diverse factors cause differences in yield for each type of field and some are difficult to elucidate. We are aiming to develop new soil assessment technology that can evaluate the productivity of wheat and soybean from field survey of productivity and soil characteristics. We are also working on the development of individual technologies for simplifying soil diagnostic methods. Arbuscular mycorrhizal fungi are symbiotic microorganisms that help absorb various nutrients including phosphate. We have demonstrated that reduced phosphate fertilization to soybean is possible after cultivating AM fungus host plant since AM fungal density increases and phosphate absorption of the next crop is promoted. Currently, we are aiming to develop technology to reduce phosphate fertilizer more by precise evaluating AM activity in soil. 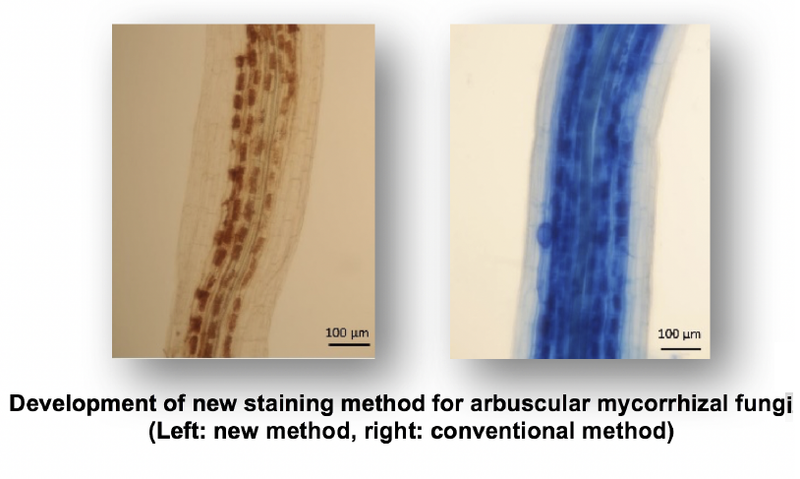 We also conduct basic research using AM fungi. Carbon dioxide, methane and nitrous oxide are greenhouse gases (GHG) emitted to the atmosphere from soils of agricultural lands. To mitigate global warming, we have been developing technologies to reduce these GHG emissions from soils of paddy and upland croplands. In particular, we aim to develop technologies for reducing GHG emissions which are also feasible and profitable for farmers in cold regions such as Hokkaido.